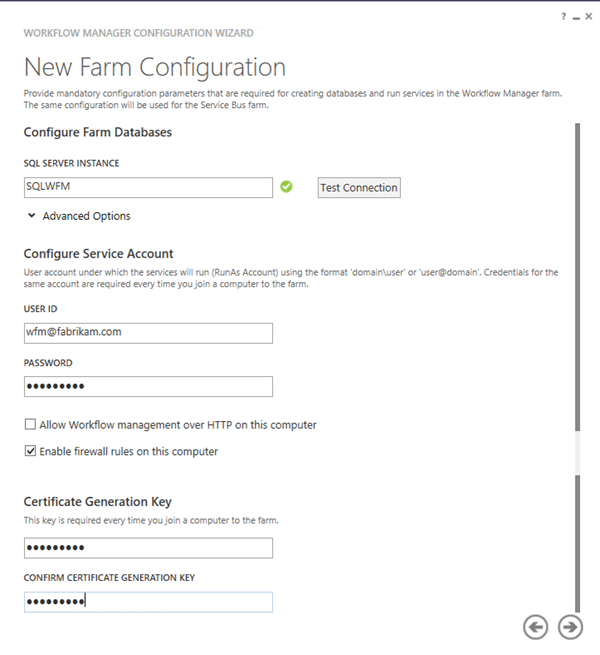 In the first part of this article we covered the core concepts along with high availability, certificate and SharePoint considerations for Workflow Manager Farms. This is the essential background we need in order to design our deployment. If you are not familiar with this material, read it before continuing with the steps below, as I assume you have read part one! 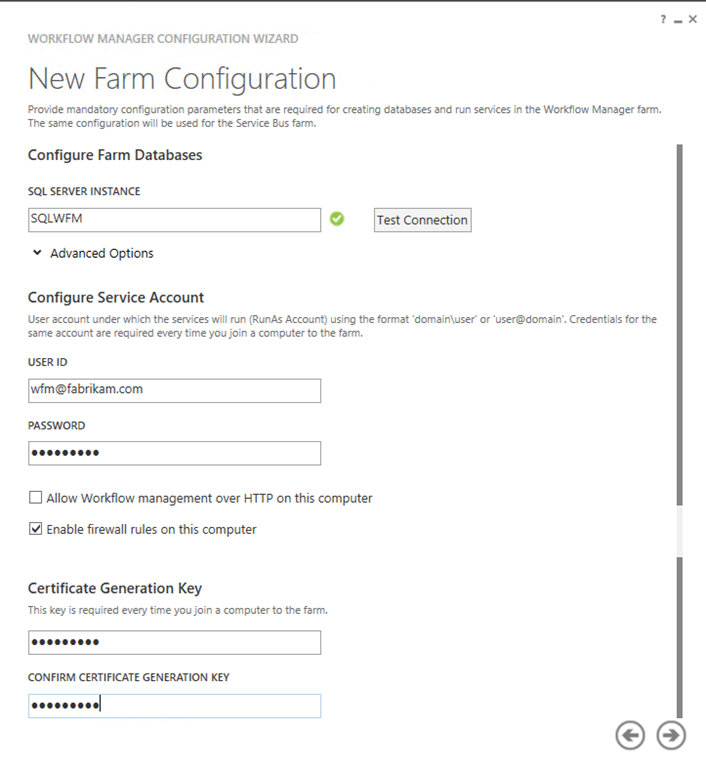 This part will cover the deployment of a highly available, SSL, Workflow Manager Farm for SharePoint 2013 using auto generated certificates and Network Load Balancing. As discussed in part one, this is the most suitable deployment model for the majority of SharePoint On-premises customers. In addition it is also the easiest way to deploy for production. Whilst this part is intended as primarily step by step configuration guidance, I will take the opportunity to also explain a few things which didn’t make sense to cover in part one. As such the steps below are not the only order of configuration. Let’s get our hands dirty with Workflow Manager! As usual I have contrived a sample scenario in order to demonstrate the configuration aspects necessary. Clearly such a scenario is not representative of an actual production deployment, and concentrates only on the elements which are important. Basically it’s the least amount of machines necessary to demonstrate the configuration. Visual Studio 2012, SharePoint Designer 2012, Office 2013 etc. Obviously the only element which will be fault tolerant or high available is the Workflow Manager farm! I assume that you are familiar with how to deal with high availability for domain services, SQL Server and SharePoint. 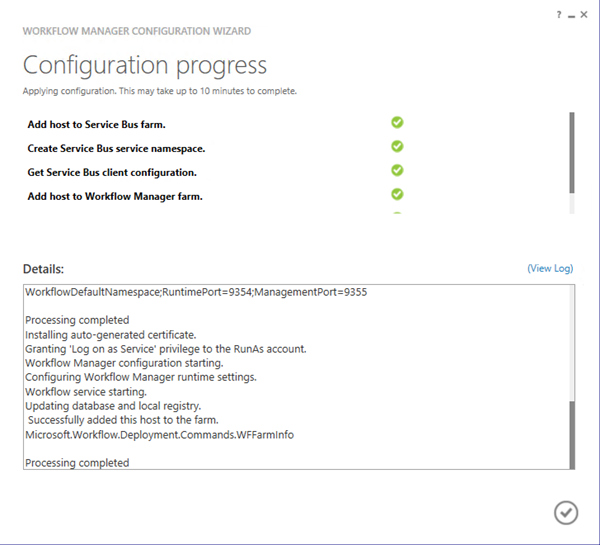 The end result we are looking to achieve here of course is a working connection to a load balanced SSL Workflow Manager farm. Workflow Manager has very light requirements in terms of pre-requisites. Basically it only needs IIS, .NET 4 PU3 or .NET 4.5. 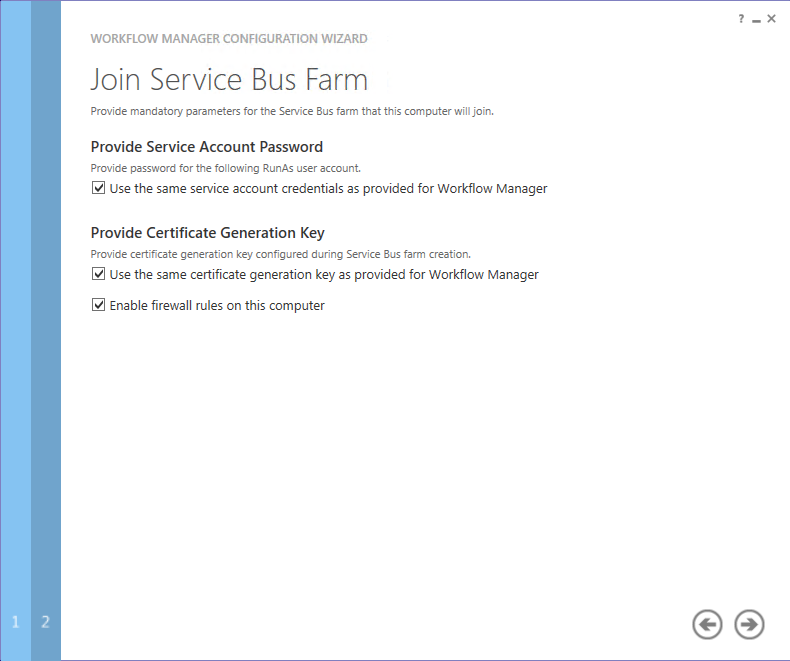 Then the Workflow Manager piece requires Service Bus 1.0, Workflow Client 1.0 and Windows PowerShell 3.0. Workflow Manager itself is installed primarily via the Web Platform Installer (WebPI) which will take care of the pre-requisites as well. There is also an offline installation approach if your machines do not have Internet access. 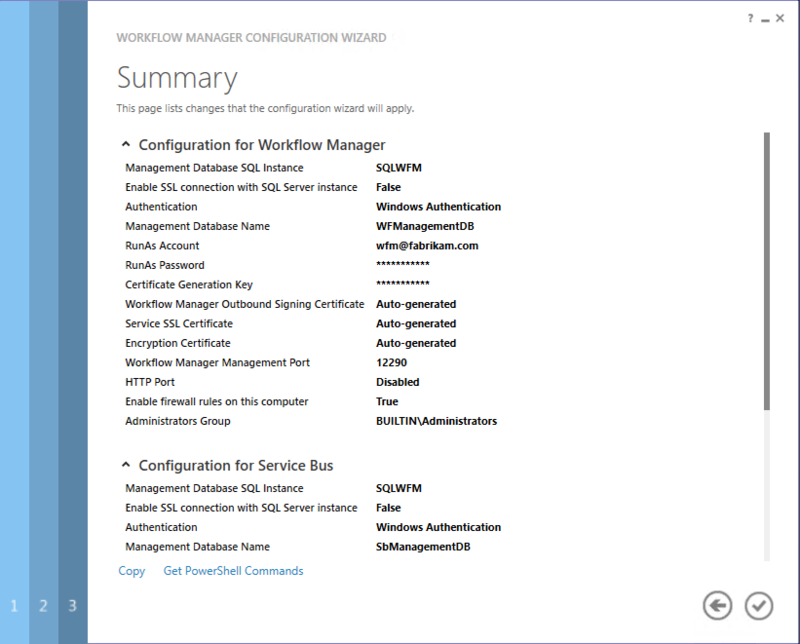 The upshot here is if you are using a single sysprep (or similar) base image you can use the same one for your Workflow Manager hosts as you do for SharePoint. Another bit of good news is that Workflow Manager’s minimum “hardware” requirement is only 2 cores and 2Gb RAM. 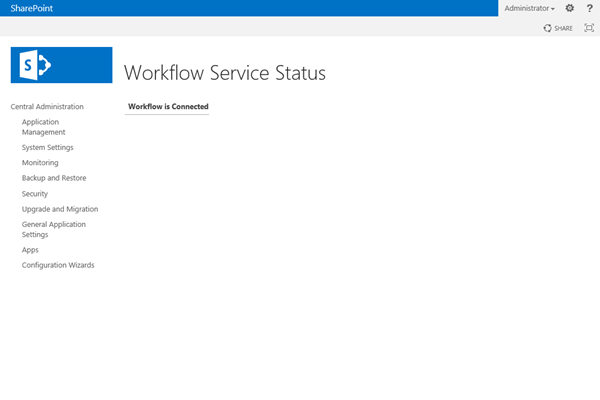 We will need however to install the Workflow Client 1.0 on every SharePoint server in the farm. 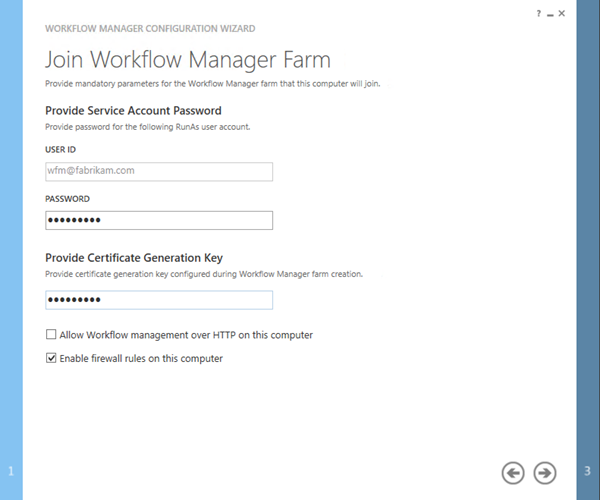 Without the Workflow Client we won’t be able to create connections to the Workflow Manager farm, create, initiate or otherwise interact with workflows. 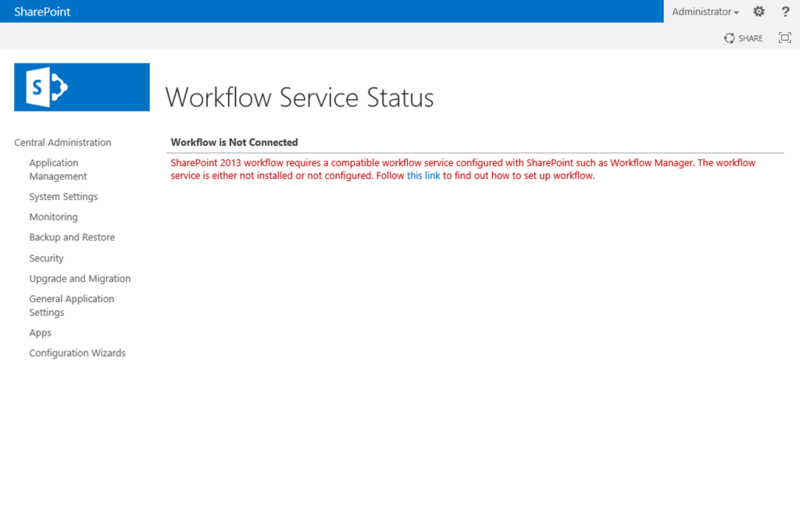 Again the Workflow Client is primarily delivered by the WebPI but can also be installed in “offline” scenarios. What I have done is bake this into my base image. However you should get familiar with performing the offline installation which is common across all products delivered via WebPI. On a machine with Internet access, download and install the Web Platform Installer v4 Command Line. For a while this was Preview, now it’s RTW and it’s right now v4.6. The version changes over time so use the “permalink” above to get the latest and greatest. cd "c:\Program Files\Microsoft\Web Platform Installer"
This will take quite a while - the WebPI will download a manifest of available products and create the folder specified in the Path switch containing the Products specified in the Products switch and any of its dependencies. It’s roughly around a 300 Mb download in total. 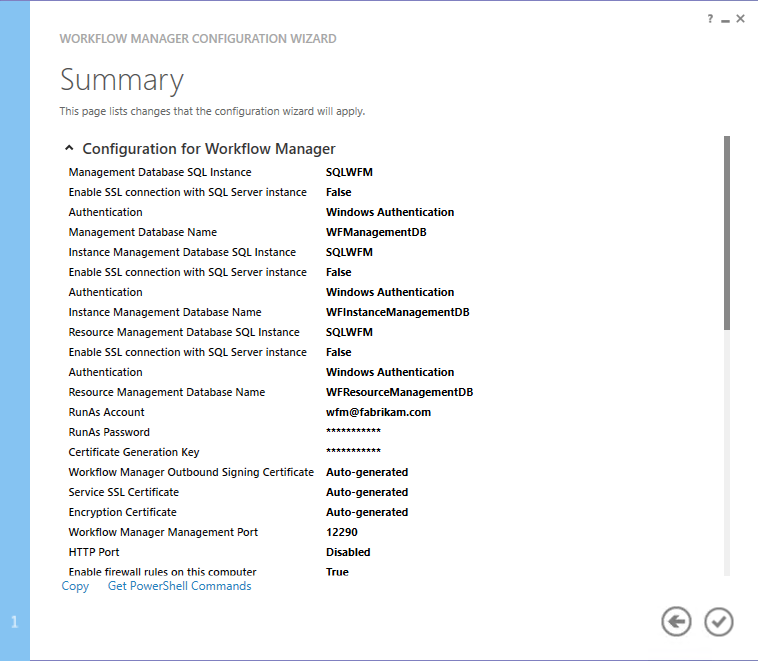 Note that I specified WorkflowManager in the Products switch. Because the Client is a dependency for the Manager, this one set of files can be used to perform an offline install of both the Manager and the Client. 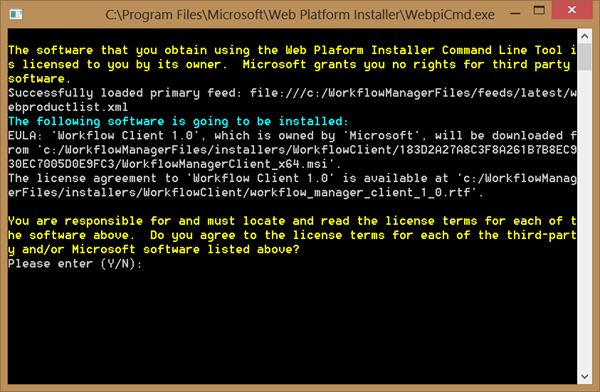 Note that all the documentation talks about c:/WorkflowManagerFiles/feeds/shadow-webproductlist.xml. Also, never use Workflow for the Product. That will install a nasty old pre-release build, and we don’t want that. Type Y, and hit Return and the installation will proceed. Our other pre-requisite if of course Network Load Balancing (NLB). We also need to install this on each server in the Workflow Manager farm. This is a snap to install via Server Manager. Simply select the Windows Server Feature Network Load Balancing. By default this will include NLB and its remote administration Windows PowerShell module and the circa NT4 Option Pack GUI. This is something else I bake into my base sysprep image for application servers. 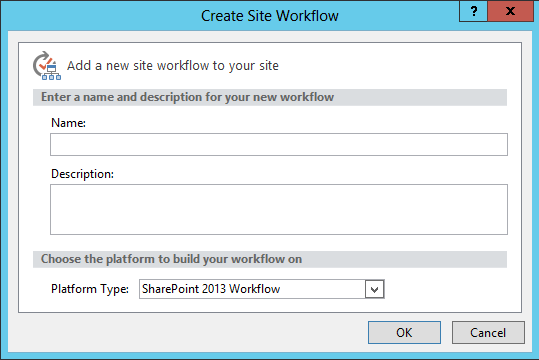 We configure a NLB cluster so that we can access Workflow Manager from SharePoint using a virtual name. We need a DNS A record for that virtual name which we will use when creating the NLB Cluster. Click OK, followed by Done. 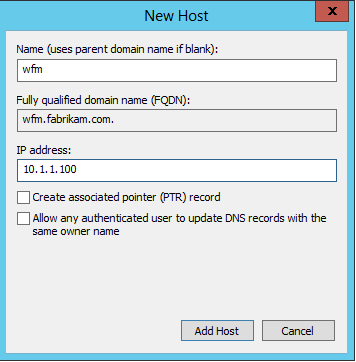 Add-DnsServerResourceRecordA -Name "wfm" -IPv4Address "10.1.1.100" -zone "fabrikam.com"
Now we can proceed and create the NLB Cluster. The Remote Administration Tools for NLB still ship with the NLBMgr.exe tool, a GUI for managing NLB. It works after a fashion, and as much as it makes me feel all comfy with its NT4 Option Pack style and finesse, I really don’t like using it. It often causes more problems than it solves and we can do the same thing much more easily with Windows PowerShell, so I am not going to detail the steps with NLBMgr.exe. Also depending upon your virtualisation platform, how many network adaptors in your hosts, and how you are connecting to the hosts will determine where to run NLBMgr and what will happen when the NIC is updated with the cluster configuration. Because I don’t know what type of environment you have, we will configure a Multicast cluster – which while not optimal will work everywhere, even on a Hyper-V machine with a single NIC in each guest. The safest option is to run this script from a machine which is NOT going to be part of the cluster – that will avoid your connection being dropped if you are using Remote Desktop to connect to the hosts. 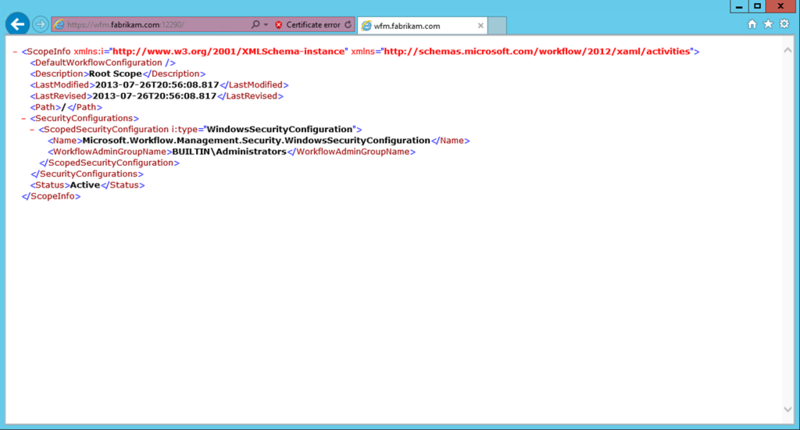 Remember to install the Remote Administration Tools for NLB using Add-WindowsFeature. Now we have our base platform taken care of, we can proceed to create and configure the Workflow Manager Farm. 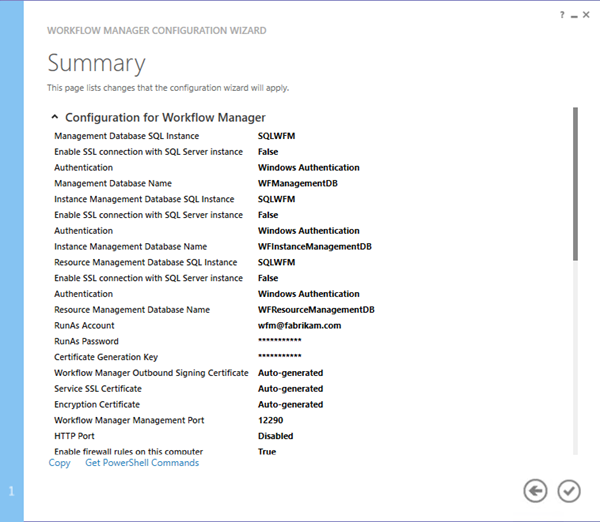 There are a few things I like to do as standard for Workflow Manager production installations. These are not “best practices”, just recommendations! Use a SQL Alias for the SQL Server. It’s all very well and good having HA for the Workflow Manager hosts, but we shouldn’t overlook the database platform in this respectJ. I’m using a SQL Alias of SQLWFM in this example. Don’t store the Service Bus and Workflow Manager databases on the same SQL Instance that hosts your SharePoint databases. Don’t collocate this stuff in production, it will only hurt you later. For this example I have a single instance hosting everything. Use a dedicated Service Account Identity. I use the same one for both Workflow Manager and Service Bus. In this example I’m using wfm@fabrikam.com (fabrikam\wfm). Everything else I leave at the defaults. One could change up the database naming convention, but that is only really of help if you are co-locating databases. Enter a Certificate Generation Key twice, and remember it! 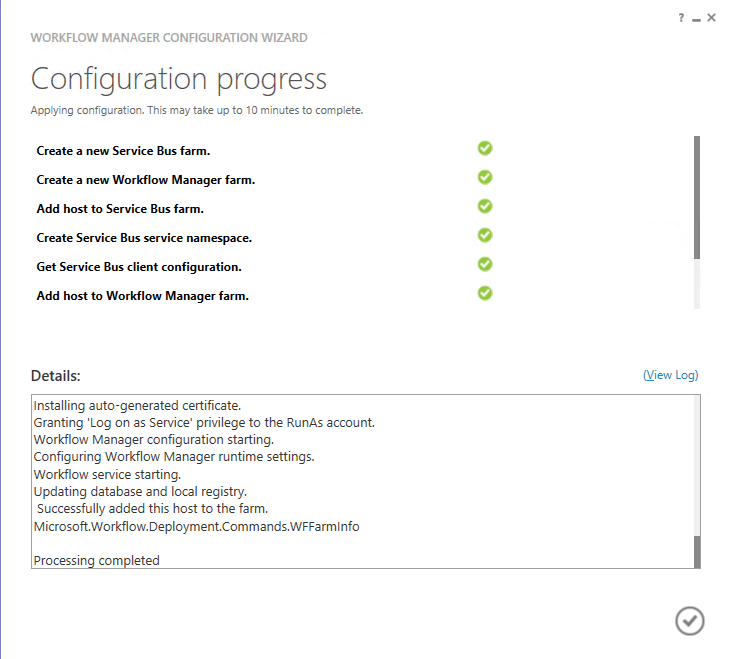 Now we go ahead and run the Workflow Manager Configuration Wizard on the second and third servers in the farm (FABWFM2 and FABWFM3). At this stage it is prudent to test the Workflow Manager Farm is responding on its virtual name from a machine which is not part of the farm. This also allows us to easily access the certificate we will need in the next stage. Using Internet Explorer, browse to https://wfm.fabrikam.com:12290. We will see a certificate warning – as the certificate is untrusted. 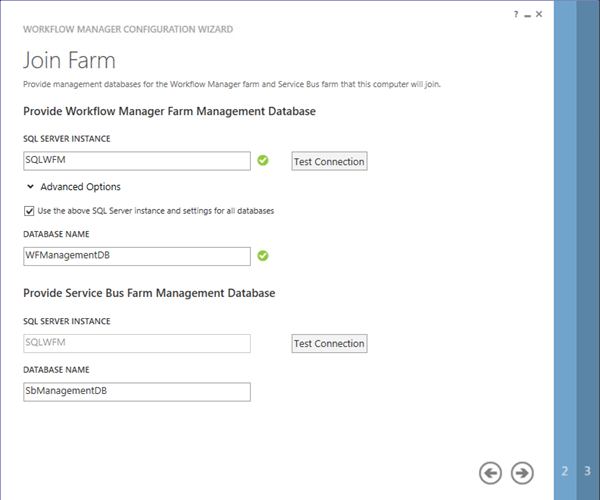 Now we have a functional Workflow Manager farm, load balanced we can use its virtual name to create the Service Connection in SharePoint. These tasks assume that your SharePoint Farm is up and ready. We also need a SSL Web Application listening on https://intranet.fabrikam.com. Watch out with this cmdlet. If the certificate file doesn’t exist it will still create a trust! Way to go SharePoint! Make sure to watch the output for any errors. If there are some, you will need to delete the trust before running New-SPTrustedRootAuthority again after resolving the problem. 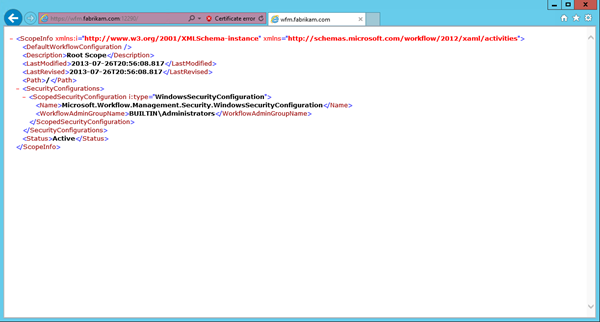 Register-SPWorkflowService -SPSite "https://intranet.fabrikam.com" -WorkflowHostUri "https://wfm.fabrikam.com:12290"
Again watch out with this cmdlet. Notice a trend here? If this command fails the Service Application Proxy will still be created but it will be effectively broken. Again monitor the output for any errors. Clean up the connection and re-run Register-SPWorkflowService after resolving the problem. But be wary, this will not always be the case. It’s entirely possible to have a broken Workflow connection, and this page display a connection. The only real way to test properly is to crack open SharePoint Designer and attempt to create a SharePoint 2013 Workflow and then actually execute it. Launch SharePoint Designer and open https://intranet.fabrikam.com, wait whilst WebDAV gets it act together. Pretty simple. We sort out our base infrastructure, create a NLB Cluster, create a Workflow Manager farm, and create a connection between SharePoint and Workflow Manager. All using pretty much default settings and auto generated certificates. The third part will cover switching to use Domain Certificates.